Management by Sales: Nothing less than maximum performance is what is demanded of sales organizations nowadays. It is no longer enough just to train salespeople. The crowning success comes only when the sales management is also at its peak. With the executive seminar Management by Sales you will discover in practice how to raise your key skills in sales management to the next level. This is because training is always a management issue as well: So that your sales team can stay on the ball, it needs managers who can prepare them thoroughly and keep them consistently motivated. In order to stay abreast of your team, Management by Sales gives you the option of either working alongside your team or individually in a seminar, where you will learn the necessary skills to steer your team onto the path of success and keep them there. If you aim to boost the performance of your employees, you must know how sales management works. The right personnel selection, management by objectives, motivation, general management techniques, appraisal interviews, delegation and communication: These are the salient areas in which you can make the difference. The participants will receive concrete tips and checklists so that they can implement their know-how immediately into their daily practice. But the training doesn’t stop there. You will also discover how to represent yourself and your team within your company’s organization, how to deal with “neighboring departments” in order to gain support for your target achievements, and how to present your results to senior management. Plan your professional success within sales management and profit from this powerful seminar through its many implementation exercises and its dynamic exchange of experience. Sales management is also involved in acquiring major clients. So that here, too, you are on the path to success, you will learn all you need to know about developing a negotiation strategy, managing negotiation with important new clients, proactive key account management, complaints handling or the targeted procurement of references. Management by Sales: This is precisely the knowledge you need for a commanding sales management so that you and your salespeople are on the same page when it comes to dealing with clients. 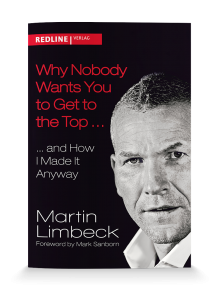 The fact that this seminar concept is a pearl among sales training programs is attested by the International German Training Prize awarded to the Martin Limbeck Training Group. We will prepare you and your team to play with the best of the best. Feel free to request further information or book your executive seminar now to ensure your sales success!